Got a query? Let us help! We have tried to address all of your queries below, however if you would like some more information please get in touch with our customer service team on 1850 94 50 23 or fill in our handy contact form here. Am I a Pinergy Smart or Pinergy Classic customer? Our revolutionary Pinergy Smart Meter & In Home Display (IHD) was launched in November 2015 and has brought a wealth of new benefits and knowledge to the fingertips of our customers. If your meter was installed before this date and, unless you have requested an upgrade, you will be a Pinergy Classic customer. Another simple way to identify if you are a Pinergy Smart or Pinergy Classic customer is by the physical appearance of the meter itself. Using the images at the top of this page, you will be able to determine if you have the classic meter, or the smart In Home Display. What’s all this about energy-saving advice? Pinergy is committed to helping households become energy efficient, helping them reduce their energy bills and carbon emissions, now and for years to come. We are constantly on the lookout for new energy efficient technology, hints and tips, updating our website regularly to bring you energy saving advice. When combined with changes in energy saving behaviour, you can make savings of up to 20%* off energy bills by using your new Pinergy Smart controller. Do I need to contact my old electricity supplier in order to switch? No – Pinergy contacts your old supplier as part of the switching process. It’s very straightforward, in fact, there will be no interruption to your supply, as the same electricity distribution and transmission system are used by all utility companies. We really hope you don’t! But if you decide to cancel your agreement, all you have to do is confirm within 14 days of entering into the agreement. 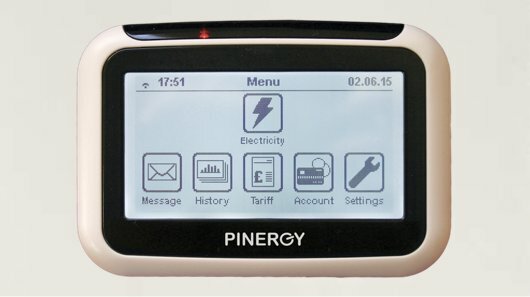 When will the Pinergy Smart meter be installed? How long does it take and do I have to be at home? We can install your new Pinergy Smart meter at a time that suits you, this could be as soon as 3 working days from the time of order validation. The installation itself only takes 45 - 50 minutes. You will need to be at home and we will need to turn off your power for a short time during install. What happens next once I’ve signed up? 2 or 3 days after signing up, you will be contacted by our installation team. They will confirm that you are happy with your install date and time and on the agreed day you will have your new Pinergy Smart meter installed. Pinergy will then be providing you with your electricity. You can then sit back and enjoy being in control of your energy costs. How long do I sign-up for and can I easily switch to another supplier? Your energy contract with Pinergy can be 12, 24 or 36 months. If you are unsure of what you are signed up, for then please call us on 1850 94 50 23. When do I get my referral top up? Once your friend that you referred is installed, please call us on 1850 94 50 23 with your Pinergy card number to claim your top up. To find out more about our refer a friend offer click here. Where can I top up my electricity? You can top up using our revolutionary Pinergy Smart App, online, at your nearest Payzone outlet here or by phone on 1850 94 50 23. What do I do if I want to move back to another supplier within contract period? If you wish to change to another supplier while still within your contract period with PINERGY, please call us on 1850 94 50 23. Lines are open 24/7. Before you move, please call us on 1850 94 50 23 to speak with a member of our customer services team. Our lines are open 24/7. If you run out of credit and you can’t top up, just activate the €5 Emergency Credit you are given when you join PINERGY. This will tide you over until you get a chance to top up again. Emergency Credit is given when the balance on your meter goes to zero. It allows you to continue to use electricity even if you have used your full prepayment. This Emergency Credit will be recouped by us the next time you top up. What happens if I use all my Emergency Credit? If you’ve used all your Emergency Credit, we won’t cut you off in the evening (from 5pm to 9am Monday to Friday), at the weekend, or on most public holidays. This facility, which is called Friendly Credit, gives you that much-needed extra time to top up. We will then just subtract the value of any electricity you use with your Emergency and Friendly Credit from your next top-up. Will I receive a statement or bill? As you are using the Pinergy Smart System and paying for your electricity as you use it, you have full visibility of how much electricity you are paying for. We therefore will not send you a bill however you will receive an annual statement which will show electricity consumption and cost for the previous year together with details of your top ups in that period. A full list of Payzone outlets can be found on payzone.ie/paywithpayzone. Please ensure you only purchase credit via the Smart App, pinergy.ie and Payzone outlets as any other purchase may be deemed invalid. How can I avoid supply disconnection? To avoid sudden disconnection, you must top-up the account appropriately when you get the Low Credit Warning Message. In the unlikely event that there is no credit on your P.S.M and all friendly credit has been used, you may loose power in your home. If I change supplier, can I get my credit refunded? If you wish to change electricity supplier please call us on 1850 94 50 23 so we can arrange to have your meter removed and returned to us.Once our engineer has called to remove your meter, we will verify any remaining credit balance and a refund will be processed. Please note, any free credit or gratuity received from us is non-refundable. All refunds will be issued by bank transfer to your nominated bank account within 30 days of meter removal. Who are Pinergy and why haven’t I heard of them before? Pinergy are an Irish company bringing a bright new alternative to the Irish energy market. We’re committed to offering consumers a simple, yet effective way of managing their utility bills to make genuine savings. Pinergy have spotted a gap in the market to provide an alternative way for people to pay for electricity. Instead of doing it the old-fashioned way, with bi-monthly bills (which are often based on estimates), we use innovative new technology that lets you pay for electricity the same way you pay for your mobile phone. You buy a top up through our revolutionary app, online, by phone 1850 94 50 23 or in your local Payzone outlet (search for your nearest Payzone outlet here). 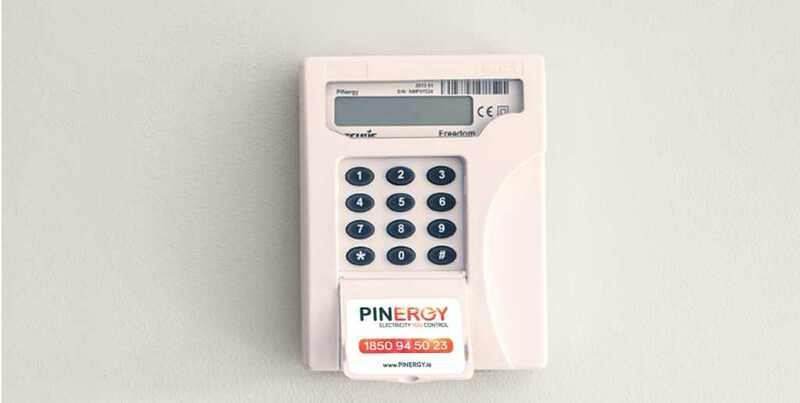 With our Pinergy Smart solution, your credit is automatically transferred to the meter in your home. Through the In Home Display, you can see exactly how much electricity you’re using and how much it costs at all times. As you pay up-front, there are no hidden surprises. The technology will alert you when you need to purchase more electricity. How is Pinergy different to other electricity providers? Most of us are in the dark when it comes to our electricity usage and how much it costs us. Pinergy is different to other electricity providers because our goal is not to hide behind confusing tariffs and charges but give you full control over how much you pay and when you pay. With our revolutionary In-Home Display and Smart App you will be able to monitor and track exactly how much electricity you’re using and what it costs in real time, at any time. No more bills, means no more paying based on estimates and no more unpleasant surprises when your bill arrives. How can I see what electricity I'm using now? You can press number 6, this will show you how many KwH (Kilowatts per hour) you are using. Press 6 again and this will show you how much it is costing you! Will I get a warning when my credit runs low? An alarm will sound once your credit reaches €2 - this will remain on for 2 minutes. Press any button to turn off the alarm. I don't have a freedom unit, will I still get an alarm? No, the alarm is built in to the freedom unit only. Press any button on your freedom unit or your Budget Controller to activate the emergency credit. I have a classic meter, can I top up using the Pinergy smart App? Yes you can still top up using our revolutionary Pinergy Smart App. Click here to see the benefits as a Classic Customer. Your IHD (In Home Display) will display a message asking you to 'Accept' your emergency credit. You can also choose to 'Ignore' the emergency credit, however, should you select ignore, the power will turn off when the credit reaches 0 (zero). How can I see what I am using now? On your IHD, press 'Menu' and then 'Electricity'. This screen will show you your current usage. You can customise this view to show KwH (Kilowatts per hour), cent per hour or CO2 emissions. I have topped up but my credit did not go on. Your meter may not have had a signal for the credit to go on automatically. Try keying the code directly in to the meter by pressing A, enter your code and then press B. Or on the IHD, press 'Menu', 'Account', 'Electricity' and enter your code. How can I tell if my meter has a signal? I have a smart meter, how does the app work? Click here to see the full features of our revolutionary Pinergy Smart App. My credit ran out and my power turned off. I have now topped up but my power still has not turned on. What can I do? When the power turns off, you will need to press 0 (zero) on the meter beside the fuseboard, then press A and then press B. This is to ensure that it is safe to turn on the power. When do I get my bulbs? Around 10 working days following install, our LED department will call you to confirm LED bulb order. Once this is confirmed, your bulbs will be delivered by courier to your home. If you think the bulbs are the wrong type or are not sure, please call us on 1850 94 50 23 and our LED department will be able to sort out any issues. Due to the nature of the product, we need to confirm the order with you before sending the bulbs. Our LED specialists may have been trying to contact you to confirm your order. Please call us on 1850 94 50 23 to confirm your contact details. My old top up history does not show on my App – why? Only the top ups made after signing up to the app will show, any top ups made before registering will not show. The balance is updated overnight each evening so the App will show this balance. This balance will also be updated any time you top up using the app. The usage on your IHD (In Home Display) is your exact usage according to PINERGYsmart. Your usage on the app is based on your average usage over the last 7 days. My balance is not the same as my IHD (In Home Display). Why? Your IHD (In Home Display) is communicating directly with your PINERGYsmart and is always accurate. The balance on your app is either the balance retrieved from your PINERGYsmart last night or the balance after you did your last top using the App - whichever was the most recent. Can I get an alert if my balance runs low but the app is closed ? You can receive an email if you have email selected in Notifications under Account. What password do I use when logging in? You use the password you used when you registered with the Pinergy mobile app. I’ve been away for 2 weeks, when I came back my app said to top up in 14 days, that was a few days ago – now it’s saying only 5 days, why? The app looks at your most recent history of usage, while you were away there was much less electricity being used. Now that you are back the app recalculated based on current usage. What does auto top up mean? You can set it up that your PINERGYsmart is topped automatically by a chosen amount every time your PINERGYsmart balance is down to €5. What does a schedule top up mean? You can set it up that your PINERGYsmart is topped by a chosen amount on a chosen date each month. For example, the day after pay day. It's possible that your PINERGYsmart meter had no signal when you topped up. If you go to 'Menu', then 'Top Up History', your last code should be displayed. If you wish to enter the Top Up code manually, go to your IHD (In Home Display) and press 'Menu' > 'Account' >' Electricity' and type in the code - your credit should now apply to your PINERGYsmart meter. If after entering the code and you get a 'duplicate' error this means that your code has been applied already. Where do I get my Premise Number? It is the number on the front of your PINERGY card. If you lose your card, please call our Customer Care who will be happy to help you. No, unfortunately at the moment our Pinergy Smart App works on iOS &Android platforms only. Are you a classic or smart customer? To see the full features of our Apps, click here.